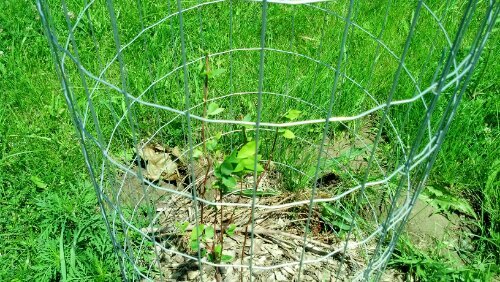 We caged up our blueberries and aronia (choke berries) last week and it amazes me how well they are doing now that nothing is eating them. 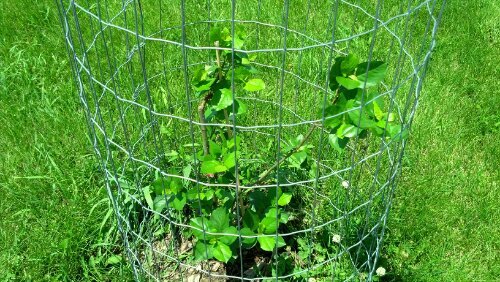 Hopefully the deer finally get the picture and leave the rest of our plants alone. I really don’t have words for this one. 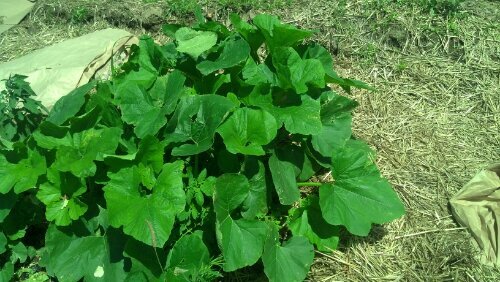 We are finding rogue squash plants all over the place and the only plausible explanation we can come up with is that our compost was not “cooked” enough before we started using it and squash seeds we had thrown in have taken root. Either that or the deer want their own garden. I know they have a taste for squash. My husband is betting on the former theory, but I wouldn’t put it past the deer. I found out that our bamboo, which is yellowing and not growing, may have a nitrogen deficiency. This seems to be a common theme for almost everything I planted so I am going to start treating with bone and blood meal in the hopes that it will turn things around. Another gardening lesson for this year…don’t be afraid to fertilize, especially if the soil needs to be amended. Why would the soil need to be amended? The topsoil may be depleted or almost depleted which means the nutrients are either completely wiped out, or in such low concentrations that they don’t do much to help the little seeds grow. There are several ways this happens: overtillage, salinization or underuse of nutrient inputs. Since our property used to be farm fields, I’m betting overtillage is the reason for our lack of good, nutrient-rich topsoil. Plants get necessary nutrients to be successful producers from the soil. The top three nutrients that are most often lacking in today’s topsoil due to depletion are: nitrogen to encourage growth, phosphorus to help with photosynthesis and strong root development and potassium to regulate plant growth so that the fruit/veggie harvested is fully formed and yummy. Of course, all of the hard work that the top three do is more involved and complex than described above, but this is the gist of their value to plant growth and development and really all the information I need right now to start amending our soil. Over time, I will do more research and learn what else I can do to get my soil on the road to recovery, but for now I will be fertilizing with organic nitrogen, phosphorus and potassium supplements via blood and bone meal.